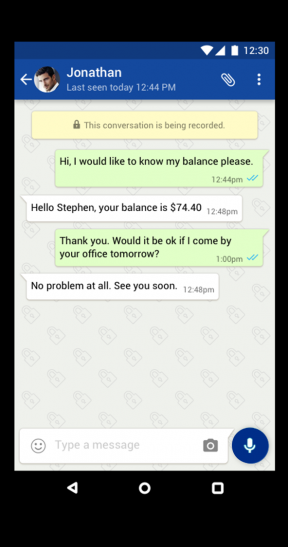 A secure and centralised instant messaging application for banks and financial institutions. HONG KONG - Dec. 13, 2018 - PRLog -- APrivacy announced today the release of its Secure Messenger application, a new instant messaging app designed especially for SFC regulated firms and intermediaries that need to secure client-advisor communications. Secure Messenger complies and satisfies the guideline rules set out by the Hong Kong Securities and Futures Commission (SFC). Secure Messenger is a free instant messaging application that can be best described as a WhatsAppTM for corporates. It was purposefully designed to ensure user experience and information security is uncompromised for all parties, while satisfying the compliance guidelines issued by regulators. The release of Secure Messenger follows the May 2018, SFC circular to financial intermediaries addressing key issues relating to communications between advisors and clients, and more specifically, the receiving of client trade orders through instant messaging apps. The SFC has put the onus on financial institutions to ensure the security and reliability of instant messaging applications used for receiving client orders, with the aim of protecting the interests of investors and financial intermediaries alike. Data privacy, maintenance of trade order records, and the cross-border nature of financial services in Asia are some key risks identified by a number of top-tier financial institutions as requiring immediate safeguards. The SFC circular made particular reference to centralised record keeping, security and reliability and compliance monitoring as it relates to instant messaging applications. Secure Messenger ensures communications to and from financial intermediaries are centrally stored, and accurate records of all client orders are completely backed-up in a system controlled by the financial intermediary in accordance with SFC guidelines. Secure Messenger aids in the identification and validation of clients who send order messages, and operates as a separate communication channel for the confirmation of client instructions, as instructed by the SFC. Secure Messenger makes data access available for compliance monitoring or regulatory data analyses. Advanced analytics featuring automated key word searches, and AI tools will become available in the future allowing for regular cross-checking of trade order messages for any irregularities, with automated flagging where appropriate. Designed and developed in Canada and Hong Kong for an audience broader than just banks - financial institutions of any size and in any jurisdiction - APrivacy's Secure Messenger is the first of its kind in the Hong Kong market, and has been updated and to be fully compliant with Hong Kong SFC guidelines. "Having released similar applications for banks previously, APrivacy received a large amount of demand to release an SFC compliant application for non-banking financial institutions. Secure Messenger was developed specifically for them - hedge funds, asset management firms, family offices, etc. - that need an off-the-shelf instant messaging application for client-advisor communications that meet the requirements of local regulators. Secure Messenger can work for a two-person company or a 2,000 person company" said Dr. Cédric Jeannot, Founder and CEO of APrivacy. Secure Messenger features multi-factor authentication, end-to-end encryption, and the recording of all conversations including text, images, documents and voice memos. The application will be released free of charge and can be accessed by any financial institution seeking to conform to SFC guidelines. This freemium model will be complemented by additional paid features such as advanced in-app AI enabled analytics and compliance tools and multi-country data storage options, to be released at future dates. Secure Messenger is available on iOS (https://itunes.apple.com/us/app/aprivacy-messenger-sfc/id...) and Android (https://play.google.com/store/apps/details?id=com.aprivac...).